The political and economic consequences of the col­lapse of pro­duce prices in the Twen­ties and the on­set of the Great Depres­sion in Japan were marked by an unem­ploy­ment rate of 25 per­cent in 1931, factory idle­ness at 50 per­cent, exports down by two-thirds, mal­nourish­ment in farming settle­ments, and high tariff barriers in Euro­pean colo­nial mar­kets in East Asia. Using an argu­ment sim­i­lar to the Nazi’s man­tra for Lebens­raum in East­ern Europe, oppor­tu­nistic Jap­anese poli­ti­cians, mili­tary offi­cers, and media out­lets, with popu­lar sup­port (uni­ver­sal male suf­frage was on the hori­zon), looked to main­land China for living space, new areas for agri­cul­tural exploi­ta­tion, new mar­kets, and a national eco­no­mic recovery powered by an aggres­sive China policy. By 1928 many in Japan felt that Man­chu­ria, a richly endowed pro­vince three times the area of the Japa­nese home­land and con­taining 40 mil­lion people, was the solu­tion out of the eco­no­mic dis­tress felt by 80 mil­lion of their country­men. 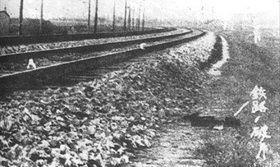 On this date in 1931 Japan seized Man­chu­ria by force after con­tri­ving an inci­dent—the so-called Muk­den Inci­dent—when a 5‑foot sec­tion of rail­road owned by Japan’s South Man­chu­ria Rail­way was damaged in an ex­plo­sion. Five months later, on Febru­ary 18, 1932, Japan estab­lished the pup­pet state of Man­chu­kuo (1932–1945), despite Chinese appeals to the League of Nations and to the United States under terms of the Kellogg-Briand Pact (1928) and the Nine-Power Treaty (1922). To create a sem­blance of legiti­macy, the last Em­peror of China, Pu‑Yi, was in­vited to be the head of state for Man­chu­kuo. In actu­ality, Pu‑Yi was nothing more than a figure­head; real author­ity rested in the hands of Japa­nese mili­tary offi­cials. Manchu minis­ters served as front men for their Japa­nese vice-minis­ters, who made all deci­sions. Most world powers refused to recog­nize Man­chu­kuo, choosing to ignore Japan’s fait ac­com­pli and un­willing to engage the Japa­nese out­side the halls of diplo­macy. Japa­nese machi­na­tions in north­east China led to one expan­sive move after another and ulti­mately to full-scale war with China in 1937 followed by war with the United States and its colony-holding Allies in the Asia Pacific region. With­in a year after Pearl Harbor, the Japanese aggressors had met their match. 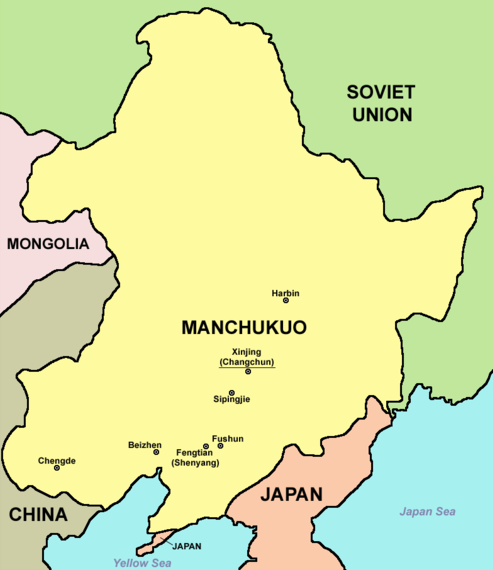 Above: Manchukuo (1931–1945) and its neigh­bors. Part of Liao­dong penin­sula and the Korean penin­sula, labeled “Japan” on this map, had been Japa­nese pos­ses­sions since 1905 and 1910, respec­tively. The Muk­den Inci­dent (Septem­ber 18, 1931), which gave the Japa­nese the pre­text to create the Man­chu­kuo state, took place near pre­sent-day Shen­yang, as it appears on the map. During the Man­chu­kuo era Shen­yang was called Feng­tian in Chi­nese and Muk­den in Eng­lish and Manchu. Shen­yang devel­oped into a cen­ter of heavy industry during the Japanese occupation. Left: Section of the supposedly damaged South Man­chu­ria Rail­way tracks near the old walled city of Mukden (now Shen­yang, capi­tal and largest city of Liaoning Pro­vince, as well as the largest city in North­east China). The Japa­nese cap­tion on the right reads, “Rail­way Frag­ment.” The night­time “sabo­tage” was planned by junior offi­cers in the Japa­nese Kwan­tung (Guan­dong) Army, which was gar­ri­soned in Man­chu­ria to pro­tect the Japa­nese-leased terri­tories along the South Man­chu­ria Rail­way and in the south­ern part of the Liaodong peninsula. 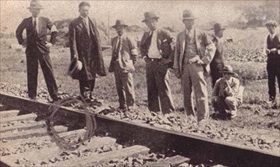 Right: A photo published in the jingoistic Japa­nese news­paper Reki­shi Sya­shin shows several pur­ported Japa­nese experts in­specting the scene of the Chi­nese “rail­way sabo­tage” on a very small por­tion (circled) of the main track of the South Man­churian Rail­way in Septem­ber 1931. Most West­erners at the time believed the Muk­den Inci­dent, though coming on top of other Sino-Japa­nese inci­dents, was way over­blown and should not have led to Japan’s take­over of Man­chu­ria. Japa­nese pub­licists were quick to point out to their Amer­i­can audi­ence how pro­vo­ca­tions in the Carib­bean had brought swift inter­vention by U.S. Marines. 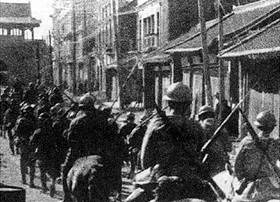 Left: Japanese cavalry entering Mukden (Shen­yang), Man­chu­ria, Septem­ber 18, 1931, after claiming that the explo­sion on South Man­chu­ria Rail­way tracks was a Chi­nese pro­vo­ca­tion. That same month Japan’s Kwan­tung Army began a mili­tary incur­sion in North­east China (time to “cut the Chi­nese melon,” in the words of some army staff) and by Decem­ber 1931 it occu­pied a large part of Manchuria. 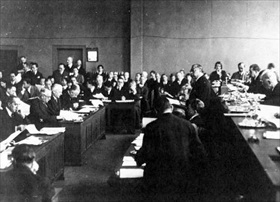 Right: A Chinese delegate addresses the League of Nations after the 1931 Muk­den Inci­dent. The Chi­nese For­eign Minis­try issued a strong pro­test to the Japa­nese govern­ment and called for an imme­di­ate halt to Japa­nese mili­tary opera­tions in Man­chu­ria. On Septem­ber 19, 1931, China appealed to the League of Nations. A month later, on Octo­ber 24, the League of Nations passed a reso­lu­tion man­dating the with­drawal of Japa­nese troops, to be com­pleted by mid-Novem­ber. Japan, how­ever, rejected the League’s reso­lu­tion. In March 1932, following Febru­ary elec­tions that gave the Japa­nese govern­ment a man­date to for its aggres­sive stance in China, Tokyo announced the estab­lish­ment of the pup­pet state of Man­chu­kuo. Japan also with­drew from the League of Nations in 1933.